Ministers like Topeka's Fred Phelps and Wisconsin's Ralph Ovadal are well-known by the general public for their confrontational tactics and decidedly non-Christian behavior toward their LGBT (lesbian, gay, bisexual and transgender) neighbors. Whether it's designing a website called "GodHatesFags.com," holding picket lines outside LGBT-supportive churches, or dishonoring the sanctity of a memorial service for a person who's died of AIDS, it's not hard to see that there's something wrong here. It's easy to see the hypocrisy of these so-called spiritual leaders, and to sense the harm that they are doing to vulnerable young people and others. Everyone can readily identify such behavior as "spiritual violence." However, as members of Soulforce Wisconsin, we are just as concerned with the words and actions of anti-LGBT members of mainstream religious denominations who hide behind a cloak of relative respectability. Defying the open and affirming example of Jesus, they deny the human equality before God of persons who happen not to fit their rigid ideal of heterosexual family. The anti-LGBT teaching of mainline Protestant denominations like the United Methodist Church is a primary source of misinformation about LGBT persons, misinformation that leads to destructive self-loathing, to anti-LGBT discrimination and even to violence and death. Although less blatant than the likes of Fred Phelps, we believe the policies and teachings of the United Methodist Church constitute "spiritual violence," in ways just as harmful. Soulforce Wisconsin met early Wednesday morning, May 21, 2003 at First Unitarian Universalist Church in Wausau where we conducted our training for the vigil. We walked from there the two blocks to First United Methodist Church where the clergy session of the Wisconsin Annual Conference of the United Methodist Church was convening. We wore white t-shirts with the "We Are Gods Children Too" message and white baseball caps with a rainbow design and and the words "Soulforce Wisconsin. 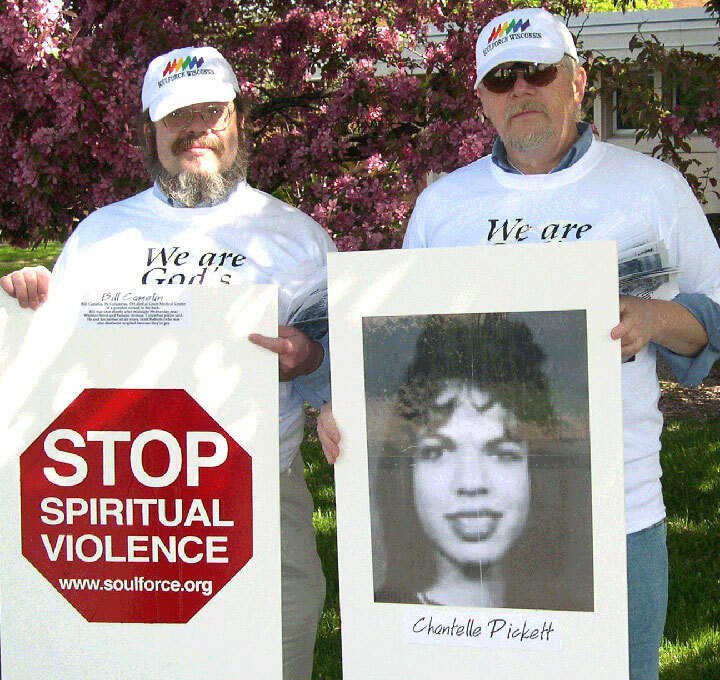 We carried Stop Spiritual Violence signs with large pictures of some of the victims of spiritual violence and hate crimes. We handed out flyers titled Why We Vigil to explain our action to the clergy and passers-by. Wausaus First United Methodist Church (FUMC) is a LGBT-friendly congregation that hosted a community healing service six weeks ago after the notorious Rev. 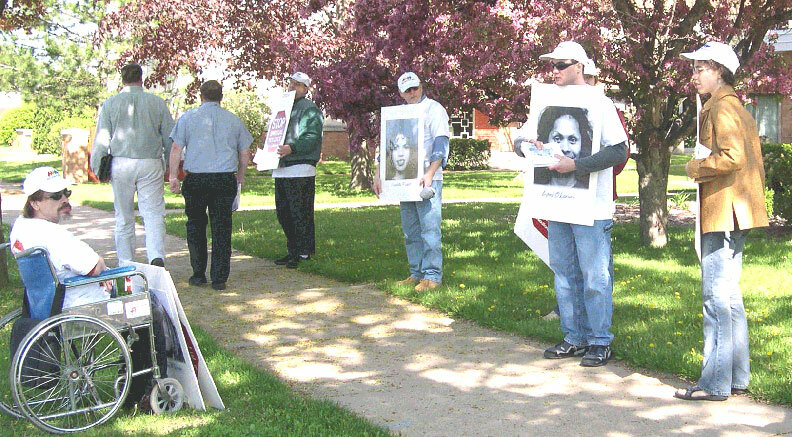 Fred Phelps picketed several sites in Wausau including First UMC. We had met with their pastor, the Rev. 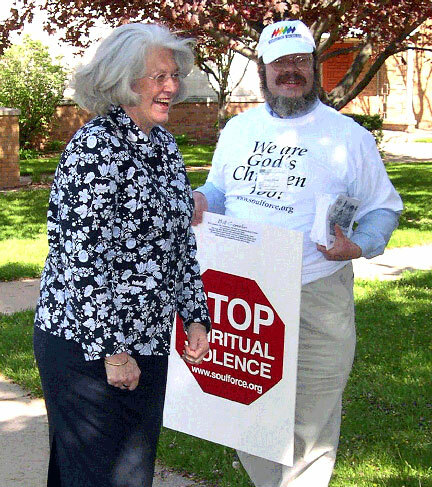 Bernadette Brunner shortly after the Phelps visit to inform her that we, too, would be standing with signs outside her church during the clergy session of the Wisconsin Annual Conference. However, we wanted her congregation to know that our message, and our methods, were notably different. We had many friends and allies in the United Methodist clergy session, including Wisconsin United Methodist Bishop Sharon Rader. It would have been misunderstood if our vigil was directed towards these friends, so we more specifically identified our adversary. Our adversary in this instance is WACUM (Wisconsin Association of Confessing United Methodists). 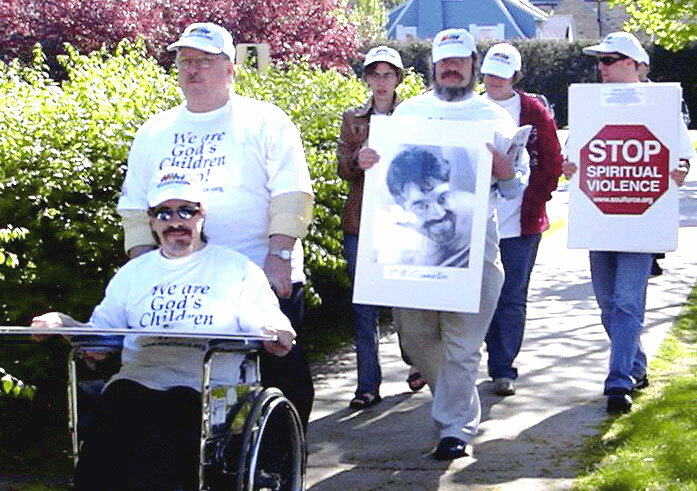 WACUM is associated with a national right wing movement to take over the United Methodist Church for the Christian Right and its neoconservative political allies in Washington (well-documented in the recent book, United Methodism at Risk: A Wake-Up Call by Leon Howell (Kingston, N.Y.: Information Project for United Methodists, 2003). The book documents how homosexuality is used as a wedge issue in order to promote the political agenda of organizations like the Washington-based, neo-conservative, pro-war Institute on Religion and Democracy (IRD). We were well received. Our hosts at our training site at First Unitarian Universalist were very hospitable, providing us with plenty of unexpected coffee, juice and cookies! 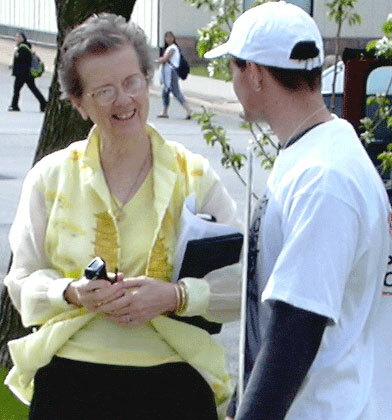 When we took our spots in front of First United Methodist Church, Bishop Rader came out to greet us and introduce herself individually to each person in our group. Later, Pastor Bernadette Brunner of First U.M.C. and the District Superintendent (an office in the United Methodist heirarchy between Pastor and Bishop) Lynn Scott also came out to greet us in an encouraging way. First United Methodist Church showed us hospitality by bringing us cookies and bottled water! Although we saw some WACUM folks from a distance, none of them acknowledged our presence. We connected with many pastors who have supported us for many years and we built on old relationships. Soulforce Wisconsin is a licensed local group affiliate of Soulforce, Inc., a national interfaith movement committed to ending spiritual violence perpetuated by religious policies and teachings against gay, lesbian, bisexual, transgender people. Both organizations teach and apply the nonviolent principles of M.K. Gandhi and Martin Luther King to the liberation of sexual minorities.